How Much Does It Cost To Produce One Barrel Of Oil (Chesapeake, Encana, Hess, Marathon, 2014)? The profit any oil company makes depends on the costs its needs to produce its goods. The oil price fall in 2014 led to high impairments in the industry, while some companies could profit from derivatives. Generally, oil companies struggles to cover their capital expenditures with operational cash flow. There is a trend for higher liquid production within the independents. Oil/petroleum is the single most traded commodity on our planet. As some derivative of oil can be found in nearly all products of daily life, it is hardly possible to exaggerate the importance of hydrocarbons for our civilization. Not all enterprises that are called "oil companies" actually produce oil. The oil and gas industry is commonly divided into three parts: upstream, midstream and downstream. Only the upstream industry (also called E&P - exploration and production) produces oil. Midstream is active in transportation and downstream is involved in refining of crude oil. Sometimes, oil companies also provide oilfield services to its peers. Companies active in upstream can be roughly divided into two groups: NOCs and IOCs. IOC is standing for International Oil Company. Here one can find well-known names like ExxonMobil (NYSE:XOM), Shell (NYSE:RDS.A) (NYSE:RDS.B) or BP (NYSE:BP). But also most public companies that are only active in one country would be considered to be IOCs (e.g. tight oil producers). NOCs are National Oil Companies. Among this group are giants like Saudi Aramco or Pemex. As IOCs are listed on stock exchanges, they have to comply with accounting standards and to publish annual reports. For that reason, it is relatively easy to get production and cost data. Over the last months, I have compiled 2013 cost data for 121 upstream companies. The summary can be found here and that article also includes links to smaller articles that discuss the individual companies in more details. In the meantime reporting season for business year 2014 has started. Some companies have already published their annual report, others have at least announced preliminary earnings, while some will publish within the next weeks. 2014 has seen tremendous changes in the upstream industry and in this article and the following I will investigate how they condensed in production costs for hydrocarbons. Independents is loosely used as a term for upstream companies that are not active in refining. In the context of my articles I use the term Independents for North American companies that are active in more than oil field and more than one type of resource and already have significant production volumes. Many of the Independents also have operations outside North America. In the first part of this article I already have covered 4 Independents. In this article I continue with 4 additional companies: Chesapeake (NYSE:CHK), Encana (NYSE:ECA), Hess (NYSE:HES) and Marathon (NYSE:MRO). The key point for me is to catch the real production costs of hydrocarbons as accurate as possible. For that reason I only consider costs that are directly related to oil and gas production. As the upstream business is a pure commodity business, many companies have bought derivatives to hedge their sales. As gains or losses from that instruments are not directly related to production, I do not consider them directly in my method. Nevertheless, as they might have impact on the future of the company, I mention them if they are significantly high. The same is true for impairments. Oil is hardly ever produced as pure liquid. Normally it comes as a mixture with natural gas and gas condensate. Although I only consider companies here, that mainly lift oil, they also produce significant amounts of gas. Hence, it does not make much sense to apply costs to the production of oil alone. To deal with this issue the concept of barrel oil equivalent - boe - has been perceived. 6000 cubic feet of gas at standard conditions are about one boe. All costs mentioned below refer to one boe, meaning that are the costs related to the production of 1 bbl of oil, 6000 scf of natural gas or a combination of both. Let's say the price for 1 barrel of oil is around $60 and the price for 1000 scf of gas is about $3. This means, revenue from 1 boe of oil is higher than revenue for 1 boe of gas ($60 versus $18). As there are also fields that only produce gas, this article tends to underestimate the costs of oil production. Commonly, costs are divided in costs that can directly be related to production (cost of sales) and costs that cannot directly be related to output (overhead). However, many oil companies are also active in downstream and midstream or other economic sectors (e.g. ExxonMobil in chemical engineering). Hence, I have divided sales, general and administration expenses (SG&A) by total revenues and multiplied it with the revenue of the E&P division to get SG&A for E&P. I did the same for any similar type of cost (marketing expenses, R&D) and for financial expenses. Depreciation, Depletion and amortization, on the other hand, can be directly linked to oil production. Exploration costs are costs related to all attempts to find hydrocarbons. This category includes cost for geological surveys and scientific studies as well as drilling costs. Lifting costs are the costs associated with the operation of oil and gas wells to bring hydrocarbons to the surface after wells (facilities necessary for the production of oil) have been drilled. This figure includes labor costs, electricity costs and maintenance costs. Non-income related taxes: as production of hydrocarbons is such a lucrative business, governments also want to have their shares. There exists an abundance of different model how the state can profit from hydrocarbon production (profit sharing, royalties, etc.). 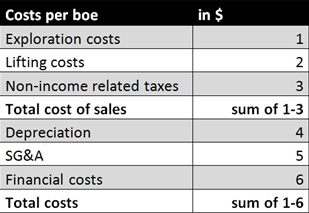 It might be, that different companies use different categories for the same type of expenses, but eventually the sum of all costs should be their total cost for producing 1 boe. As I have noticed in one of my last articles, that cash flow situation does not look well for the majors. In the long term, a profitable company must be able to generate enough cash flow to cover its capex and to buy money back to its shareholders (either via dividends or share buybacks). Therefore I included operating cash flow and total capex in my data. Operating cash flow and capital expenditure both refer to the whole company. Capital expenditure is investment in assets as well as in subsidiaries if they are not consolidated. This number does not include any subtractions caused by the selling of assets. The gigantic fall in the oil price within the second half made 2014 a horrible year for the upstream industry. The only company that could produce more hydrocarbons in terms of boe was Chesapeake that increased its production by slightly more than 5 percent. Hess remained roughly equal, while Encana's production decreased by roughly 7 percent and Marathon's production by nearly 6 percent. Chesapeake increased its total hydrocarbon production as well as its liquid percentage. Nevertheless, realized price per boe fell slightly. On the other hand, the company decreased its total costs significantly. Especially DD&A went down, resulting in an extremely good pre-income tax margin of 40% for the company's operations. Additionally, Chesapeake could profit from gains in derivatives of more than $1 billion. Encana raised its liquid production, while its gas production fell. In sum that led to a decrease in total production, but to an increase in percentage of liquids produced of nearly 8 percentage points to 18.1%. It is therefore no wonder, that realized price per boe produced also rose significantly. Production costs increased among all categories, but did so less strong than realized revenues. The reward was a doubling of the pre-income tax margin from 2013 to 2014. A loss in foreign exchange rate of $400 million was more than offset by gains in divestitures of $3.4 billion. Additionally, it is notable that Encana hardly booked any impairments within the last two years. Hess is the company with the highest revenue per boe in this article, although its percentage of liquids produced fell slightly. Hess saw a great increase in its costs per boe, driven especially by the company's lifting costs and its general and administrative costs. The company earned a healthy pre-income tax margin if 16% in 2013. Marathon is also active in the production of Canadian oil sands, which adds to its remarkable high percentage of liquids produced. Only the continuing operations of the company are considered in this article. The price Marathon could realize for its liquid production fell by more than 10% in 2014 compared to 2013, which contributed to the rather dramatic fall in the realized price per boe. On the other hand, costs rose significantly, especially lifting costs and depreciation. The combination of those effects led to a strong decrease in Marathon's margin. Once again, the bad cash flow situation for all of the companies is remarkable. Not one of them was able to cover its capital expenditure with cash flow earned from operations. Encana invested more than twice as much as it generated in operating cash flow. All of the four companies are forced to sell assets or borrow money to finance their investments. The same is true for the payment of dividends. One should take into account, that this describes the situation in 2014, a year that saw an oil price of more than $100 per barrel in its first half. This further strengthens my opinion that the current low oil price level is by no way sufficient to provide a sustainable environment for the upstream industry.